With eDesign HAWE Hydraulik presents a graphical programming interface for the first time. It enables the user to design programs and to install it directly on the electronic control without knowing a programming language. 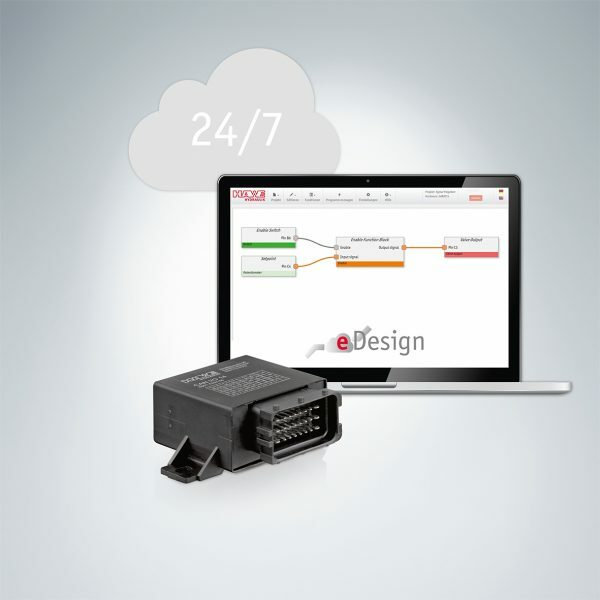 The new cloud-based, graphical programming interface for electronic control systems, HAWE eDesign, offers users a clear interface with intuitive operation. A complex programming code, consisting of thousands of lines, is replaced by only one graphical notation. This allows even non-experts to program complex applications. The graphically “programmed” logic will be compiled automatically on a server into the actual program code, which is required by the electronic control. This is then installed on the control by a click of a mouse. The machine can be put into operation immediately. In addition, HAWE eDesign allows users to define basic parameters such as setpoints, ramps, etc. The software is cloud-based and therefore accessible from anywhere 24/7. It can be accessed via all common browsers. HAWE eDesign already includes a large number of functions to program either the CAN-knot type CAN-IO or the electronic amplifier plug type EV2Sof HAWE Hydraulik. The programming interface, developed in-house, is ideally suited to facilitate the transition from on/off valve technology to proportional control, and is primarily intended for low to medium complex programming. Built-in tutorials and hints simplify the use. For more information, please visit http://www.hawe.de.